It is better to have dry carbohydrates for breakfast or a healthy snack if you are fed up of regular biscuits and breads. 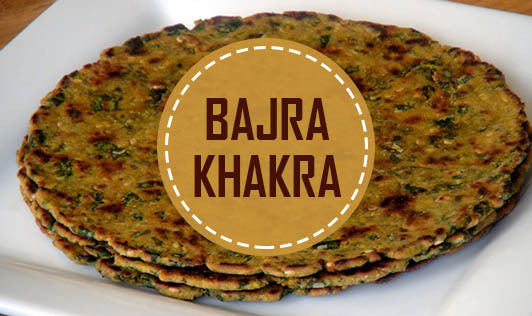 Bajra, with its high fiber content would be apt for people with diabetes and heart diseases. 1. Combine the bajra flour, whole wheat flour, ginger-garlic paste, green chillies, sesame seeds, turmeric powder, oil and salt. 2. Add enough warm water and knead well into a firm dough. 3. Divide the dough into 7 equal portions and roll each on a floured surface into a 75 mm. (3") diameters thin circle. 4. Cook on a hot tava (griddle) on both the sides with a little ghee until brown spots appear on top of the rolled out dough. 5. With the help of a folded muslin cloth, press the khakhra from all sides and cook till crisp, over a slow flame. 6. Repeat for the remaining to make 6 more khakhras. 7. Cool and store in an air-tight container.